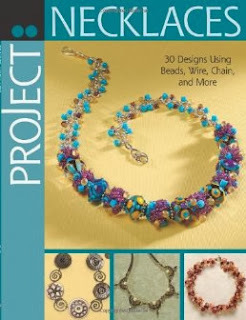 Project: Necklaces, published by Kalmbach Publishing, has a wonderful array of 30 necklaces for beginners and intermediate beaders. All the projects can be found in previous issues of Bead & Button magazine, and are all fully-tested winners. The introduction has all the info you'll need on tools and materials, the techniques that you'll use, and how to fit a necklace properly. This fitting section is the best part of the book besides the projects with very useful tips. The rest of the book falls into four sections: stringing, single stitch pieces, combined techniques, and wirework. Would you like to win a free copy of this book? Here's what you need to do...please read this carefully. Leave me a comment here and include your email address. If I don't see your email address, I won't be able to contact you. No contact, no win, and I simply have to go on to the next person. You are welcome to spell it out if you'd prefer, for example, cyndi at mazeltovjewelry dot com. If you tweet or post on Facebook or other social spots about the contest, you can leave a second comment and be entered twice! Deadline: December 3, 2013. Is this open for international? I would love to win this book! The necklaces are so beautiful! Great book. Would love to win! Would love to win a copy of this book. Thanks for the giveaway. This sounds like a great book. Would love to win a copy. I would love to win this! I forgot my email earlier. 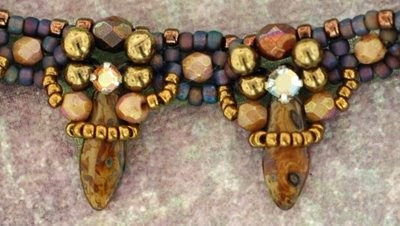 I am in love with the necklace you pictured by Stephanie Eddy. Thank you for another wonderful giveaway offer! I pinned the contest. Here's the link. Would love to win his book!!! Pretty please count me in! This book would be a lovely jumpstart for the gift-giving and gift-making season! I would love to have your book. The pictures on the cover look very interesting and I'm sure the projects on the inside, will be just as exciting. Thanks for the giveaway. Wow! I'd love to win this book. I also shared on my FB business page and my personal page. I'd love a chance to win a copy of this book. Looks like a lot of fun! Thanks for the giveaway! I love your favorite---would LOVE to win this book! Thanks for your generosity in offering it this way! Great book. Thanks for the giveaway. what a wonderful piece! love it! a_DIRIENZIO@BELLSOUTH.NET ..and I would love this book. Ｉ just read the post. Unfortunately the giveaway deadline just pasted. I am operating a online store. Are these necklaces sale well online?